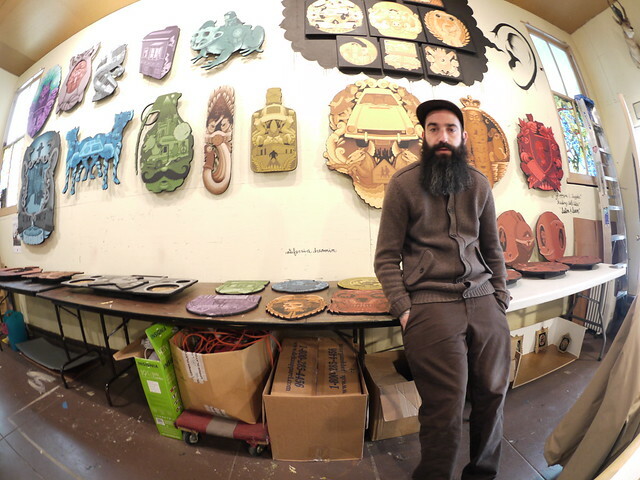 Last November, San Francisco based illustrator Jeremy Fish (covered here) suffered from a brain aneurism that changed his life and approach to artmaking. The twenty works featured in his exhibition “Anger Management” at Black Book Gallery in Denver were created between surgeries to treat his condition. Fish has had to seek new ways to reduce stress, including visiting an anger management specialist, inspiring the series’ title. In new ink, acrylic on wood, and custom skate deck pieces, Fish draws his cute and creepy animals like owls, beavers, jackalopes, and candy skulls with brainy motifs. Now on view at Mark Moore Gallery’s project room is “Hunting Trophies” by Jeremy Fish, marking his first solo exhibition there. (We previously covered Fish’s work at Mark Moore gallery here.) Fish injects a high dose of color to the space where he appears next to Christopher Russell’s monochromatic prints, “GRFALWKV”. Walking into the exhibit is like stepping inside Fish’s own trophy room, stacked with cartoon animal ‘kills’ in his highly saturated, illustrative style. 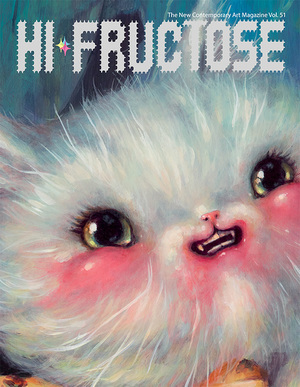 Hi-Fructose caught up with Fish to talk about his new work. Tonight, Thursday, June 23rd, San Francisco-based artist Jeremy Fish will be debuting his latest body of work, ‘Listen and Learn’ at Joshua Liner Gallery in Chelsea. A visual compendium of short stories compiled over the last year, Fish documents the lives and moments from a variety of artists, snowboarders, musicians and interesting characters. From a veteran beat cop in Fish’s North Beach neighborhood to superstar musicians such as Snoop Dogg, each five minute anecdote has been re-imagined in Fish’s recognizable illustrative style providing an intriguing portrayal of post-pop portraiture. For tonight’s opening, expect stations where viewers can hear the recoded backstories behind each piece, the show is on view until July 16th, highly recommended. As Jeremy Fish wraps up the European leg of his Road Less Traveled tour, Hi-Fructose checked in with Fish’s travel mate and photographer extraordinaire, John Dragonette. The pair (plus Willie the garden gnome, seen above) have made stops in Cologne, Amsterdam, Hamburg, and are currently sweating it out in Warsaw. Catch up with Jeremy, John, and Willie after the jump. Jeremy Nichols is an artist hailing from Portland who creates graphite on paper works that he often refers to as “alien worlds.” In his youth, Nichols spent time traveling between upstate New York and Tokyo, which he says created a strong sense of displacement within him. He takes these memories of unsettled feelings to create worlds that feel otherworldly, using recognizable patterns and textures to create layered drawings of floating clusters of energy. Nichols wants his viewers to walk away questioning the beauty beyond their immediate world and take a closer look at the things that they see everyday – things they tend to overlook.